Tonight, at 8:30 local time, which for us is EDT, turn off your lights and electrical appliances for one hour. Read by candlelight (but be careful), tell stories, play games like 20 questions, sing, dance, play a flute. Do any of the wonderful things people have done for millenia. Talk to each other, live, face-to-face. Paint your cave walls. Snuggle. This is Takoma Park. We're good at this sort of thing. And we care. Lots of challenges are going on out there. 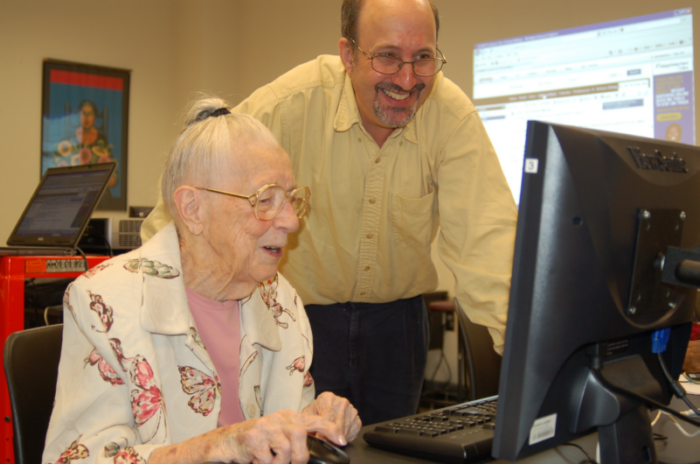 Just search for earth hour challenges or " i will if you will"
Dottie Brown, who has been living in Takoma Park since the mid 1950's, has been enjoying the Seniors Computer Class a lot. She is 95 years old. Metro is considering changes to the F4/F6 services. These are the Metro buses that stop right in front of the our library. The F4 also stops in front of the New Carrolton Library. And they pass very near the Hyattsville, Silver Spring and University of Maryland Libraries. . This is a sort of library route. You can go from one to another by bus, without changes or long walks. Do you have have an opinion or want to hear about the issues? Two public meetings are scheduled for this week. Wednesday March 21, Hyattsville Library, 6-8 PM. The Friends of the Library have just purchased 50 digital reference sets for us. Please take a look. There is was one bad feature, and scores of good ones. ... is gone. Update 03-14 (pi day): The annoying survey has been removed. Cheers. You can download articles as pdf or mp3 files, look at, or listen to, a translation. These are actual reference books, with professional writers, editors and fact-checkers. The real thing: copyrighted and expensive. These people do get paid. We are starting with 50 titles and can add more. You don't have to check anything out or wait around for a book to become available. It's just there for you whenever you want. After you search, get the text of the article you want to view. You will then see tabs across the top letting you listen to the article, save it as a pdf, save the audio as an mp3, fetch a translation, etc. Want to browse through a book? After a search, click on title list and find a book that interests you. Then look through the table of contents to find something intriguing. Thank you to all the Friends.